Vasili Mikhailovich Altfater was a Russian-Soviet naval officer, the first Commander-in-chief of the Soviet Navy. Vasili Yakovlevich Chichagov was an admiral in the Russian Navy and an explorer. He was the father of Pavel Chichagov, a Russian admiral during the Napoleonic Wars. 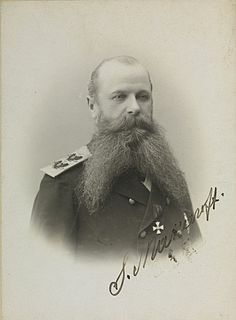 Johan Hampus Furuhjelm, was a Finnish-Russian vice-admiral and explorer, commander of the Russian Baltic Fleet, Governor of the Russian Far East, Taganrog and Russian America. Ippolit Konstantinovich Vogak was an Imperial Russian Navy admiral and the 17th and last governor of Taganrog. Pyotr Kuzmich Pakhtusov was a Russian surveyor and Arctic explorer. He is credited with the first thorough survey of Novaya Zemlya. Otto Kalvitsa was a Finnish-born Soviet aviator and a polar explorer. He is known as one of the pioneers of the Soviet Arctic aviation.